Plumbing problems happen at every home. The older the house is, the higher the possibility of a pipe cracking and leaking. Repairing these pipes is important because a leaky pipe that is not fixed promptly can burst, causing lots of damage. But most of the pipes in your home are not visible, and reaching them isn’t easy. Underneath your floors and walls there is a complex network of tubes that bring water into the house and carry it away once it has been used. Outside the property you have the same problem: the pipes are buried underneath the garden and can pass under the driveway or deck until they reach the city’s sewer line. A couple of decades ago, when a pipe needed to be repaired it meant having to dig it out. Lawns would be destroyed, walls would be torn apart, and the whole area would be filled with dirt and dust. As debris piled up and work continued, trenches were formed, which could be dangerous for children and pets. Then a new plumbing technology was invented, and digging was no longer necessary. This trenchless approach doesn’t need to uncover the pipes since they can now be repaired from the inside. However, it is a method that only a few qualified plumbers offer. At Rapid Plumbing, trenchless pipe lining in Valley Village, California is just one of the many services we have available. Our staff is trained and has access to the best pipe lining tools to get the job done quickly and safely. This is the way it works: as a first step, we will inspect the pipes using a video camera. It sends a live feed of the pipe walls, letting us see if there are any cracks or holes, as well as their exact location. Once we know what is wrong, we can proceed to fix it. For our pipe lining to work we need the tubes to be free of sludge and debris, so we shoot a high-pressure water stream that cleans them up. 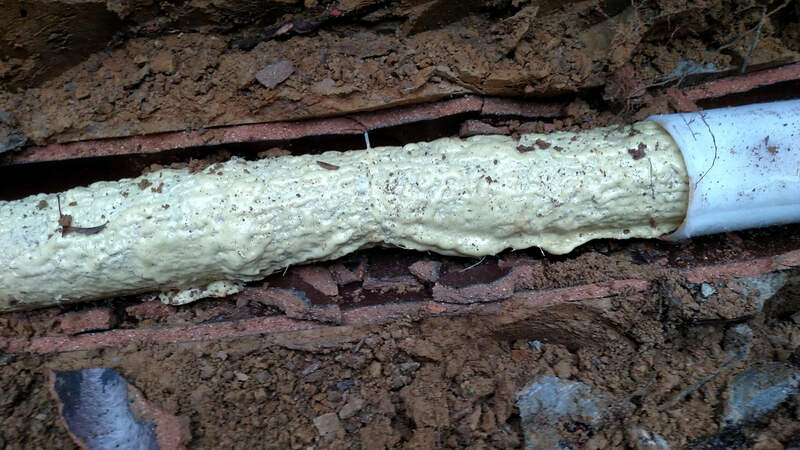 It can even get rid of tree roots and mineral buildups that are common in old pipes. All this gets flushed away into the sewer, and once the pipe is clean, we insert a special liner into it. This liner is coated with a unique epoxy formula that is activated by heat. Once it reaches the exact spot that needs to be repaired, steam is injected to make this liner expand. After a few hours, the epoxy cures and turns into a solid tube that seals cracks and holes and prevents roots from entering the pipe again. Once we are done, we will take another look with the video camera to be sure that the problem is solved. This process is much more affordable than having to dig out the pipes, and the liner will last a minimum of 50 years. Forget about digging and destroying your landscape; trenchless pipe lining is the most efficient way to solve most problems in your pipes or sewer line. Get in touch with us and schedule an appointment; our plumbers are waiting for your call and will provide unsurpassed service that fits your needs and budget.